Kirstjen Nielsen is out as the Department of Homeland Security secretary, President Donald Trump said Sunday. Trump announced that Kevin K. McAleenan, the commissioner of US Customs and Border Protection, will become acting secretary. A senior Senate Democratic aide told BuzzFeed News that McAleenan “has never given off the impression as a Stephen Miller type true believer. And he doesn’t give me the impression of someone who wants to destroy his reputation.” McAleenan, the aide said, always gave “far less partisan” testimony. “This is a career person who from what I could tell got the CBP job because he knew his way around,” the aide said. In a letter to Trump, Nielsen said that her resignation was effective immediately. In the days leading up to Nielsen’s exit, Trump took an even more aggressive tone on his administration’s immigration agenda, showing his frustration with the increasing number of migrant families attempting to cross the border. “Our country is full,” he said on Friday, after threatening to to completely close the border earlier in the week. But Nielsen was often the target of Trump’s frustrations with the increasing rates of migrant border crossings. 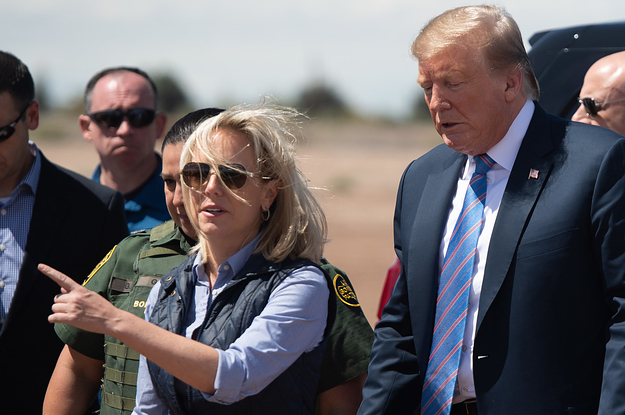 That issue appeared to come to a head in the first few months of 2019, when the figures of families crossing the border reached all-time monthly highs. On Thursday, Trump also withdrew the nomination of his acting Immigration and Customs Enforcement director, Ronald Vitiello. The president often told advisers he didn’t think Nielsen was doing enough on his biggest campaign promise, curbing illegal immigration. But toward the end of 2018, Nielsen spearheaded multiple attempts at dissuading would-be asylum-seekers from crossing the border, first by implementing a ban on asylum for those who crossed the border without authorization, and then by keeping migrants in Mexico as their asylum cases proceeded in the US. These efforts appeared to win Trump’s approval for a period of time following reports in the fall of her impending departure. It appears those moves were not enough to keep her on strong footing with Trump in the end. More than anything during her tenure, the 46-year-old became the face of a controversial policy enforced at the border last year that separated families from their children under a “zero tolerance” process in which all individuals who crossed the border were to be criminally charged. But Nielsen’s press conference was a hit within the White House. Namely with Trump, who lauded Nielsen on Twitter the next day, saying that she had done a “fabulous” job “explaining security at the border and for our country, while at the same time recommending changes to obsolete & nasty laws, which force family separation. We want ‘heart’ and security in America!” Trump later told her “great job” during the signing of an order turning back the separations policy. Nielsen was brought into Trump’s orbit by then–White House chief of staff John Kelly, who reportedly protected her from being fired several times. Nielsen worked under Kelly as his chief of staff when Kelly was DHS secretary, and then became his deputy at the White House before being named his replacement at DHS. Nielsen was already treated with skepticism by some immigration hardliners in Trump’s base when the president nominated her to lead DHS. But she has repeatedly defended Trump’s calls for a wall at the southern border and enforced his immigration policies, including deploying the National Guard to the border in April 2018.